Cline puts his imagination to the test again in his second novel, creating another character obsessed with video games and 80s culture in a modern world, except this time there are aliens! A brief disclosure before you begin reading this review: I did not like Armada, and I am going to be honest throughout. Please don’t assume I’m being mean for the sake of being mean, but I haven’t been this disappointed since I didn’t receive my letter from Hogwarts (14 years ago). The excitement level I had for this book was through the roof. Ready Player One is my favorite book and the one I recommend to everyone who enjoys science fiction, video games, or is a reluctant reader. I loved Ernest Cline’s writing style in RPO, and I expected nothing but the best from him in his second novel. After hearing about the content of Armada and seeing the cover art, I was intrigued, although, I felt a sense of déjà vu after reading the synopsis. I thought the cover was clean and modern, and I couldn’t wait to add it to my shelves. If you were to ask anyone who knows me, they would tell you I had been waiting all year for July to come around so I could finally read Ernie’s next book. I had it pre-ordered and waited in heavy anticipation for what I was sure to be my next favorite. A friend of mine who also loved Ready Player One read the ARC a month before its release and came to me with disappointing news. He had decided to not even finish the book, which struck me as strange. “Really, is this your only trick?” he questioned Ernie. After several of my friends completed it and gave it poor reviews, I stayed hopeful, trusting Ernie would not let me down. Then, I read it for myself, and I was let down. I knew going into Armada it had much lower ratings than RPO. I didn’t let it get to me, though, and I tried to ignore the warning signs and enjoy it without being influenced by my friends’ negative reviews about it. As hard as I tried, I couldn’t begin to like it. That sense of déjà vu was for good reason; I felt like I was reading a more descriptive version of Ender’s Game, only it was much worse and felt rushed. The bridge between Armada and Ender’s Game is a solid one. Zack resembles Ender Wiggin, who also can’t contain his rage against his bullies. They’ve both been prepped their entire lives to destroy aliens and hired by our very own U.S. Government to save the world. Defeating aliens is not a new concept in video games, movies, or books, but some plots have already been done and don’t need to be done again. Another mirror image I noticed was the similarities between Xavier Lightman and Halliday from RPO. Now, trust me, I tried not to compare RPO and Armada, but the lack of differences was overwhelming. Halliday is almost a father figure for Wade, who has no father. Wade invests all of his time into learning about the 80s culture in order to win the contest, and similarly, Zack immerses himself into his father’s left behind 80s era possessions in order to get to know him. Both obsessions make sense, but in RPO it is done so much better. Cline rifles through 80s terminology as if he’s a dictionary, referencing hundreds of titles in RPO. For every three or four references, I’d only heard of one. After reading each chapter I felt more educated on the decade I’d just missed. In Armada there are fewer references, and the titles mentioned are much more catered to the mass media. I don’t need to hear 20 Star Wars references or quotes from Yoda. I’ve seen those enough times, thank you. With these types of references, I just assumed Cline didn’t want to put in the effort to go there for the die hard 80s kids. Again, disappointing in that regard. One major complaint, although not the biggest, was the timing. The book was evenly paced, but I had trouble suspending my disbelief for the amount of time it took everyone to travel. If it took 40 minutes to get to the moon, the travelers would be liquid. I don’t believe we will ever have the technology to create anti-inertia shuttles for this speed. Yes, I know sci-fi has been going into warp and light speed for a long time, but Armada wants me to believe we have this technology available now, and I just can’t do it. The entire book takes place within 24 hours, too. The biggest complaint I have is what pushed me over the edge and made the book completely unenjoyable. It’s a cheesefest. I can only handle so many cliches, Ernie. Not everyone in every book you write should be obsessed with the 80s. Zack Lightman’s obsession I can understand, but all of the Moon Base Alpha’s soldiers as well as Lex Larkin being obsessed, please. “It’s time to save the world.” Really? It’s save-the-world-o’clock? This line should not be in your book. Also, this is an action book. Romance is a part of life, but the chances of four or five couples falling for one another at first sight is incredulous. I know my review is harsh, and negativity like this is unlike me, but I know Ernie can do better than this. I would not hesitate to pre-order his next book, and Ready Player One remains to be my favorite book of all time. I have lost some respect for Cline because of the carelessness put into Armada, but I won’t let that stop me from being a fan. In fact, the Tome Raiders are getting ready to meet him at a book signing this Thursday. As for his latest, I would not recommend it for the lactose intolerant due to the extreme cheese factor. Is Ernest Cline a “Ready Player One-trick-pony”, or has he found the perfect formula to appeal to science fiction lovers? To say the Tome Raiders were excited for Armada, Ernest Cline’s latest romp in the world of campy 80s science fiction, would be an egregious understatement. Armada was not a terrifically hard read, and the writing style and structure is very reminiscent of Ready Player One, as is the pacing of the story. The only times I had to stop reading were to Google a reference I might not have been familiar with or to visibly rest my face on the palm of my hand because of whatever I had just read (more on this later). The plot is basic wish fulfillment, as even the protagonist Zack Lightman points out several times throughout the story. Zack is an 18-year-old gamer in his senior year of high school on plain ‘ole boring earth. He lives with his widowed mother and is trying to survive the last few weeks of school til graduation so he can work full time at his current job where he sells used video game merchandise. Nothing too ground breaking thus far, just a relatable “blank canvas” guy (maybe TOO relatable for some) the readers can imprint themselves upon. Zack longs for adventure and intrigue to pull him from his unexceptional life, when one day he looks out of his classroom window and sees flying over nearby fields and forests a UFO that eerily resembles the alien starfighters he combats every day in his favorite video game, Armada. Zack is then recruited to the Earth Defense Alliance, along with all of the world’s top gamers. It is here that they discover the world’s two most popular video games, Armada and Terra Firma, were actually combat simulators preparing Earth’s citizens to defend their planet from an incoming alien invasion. 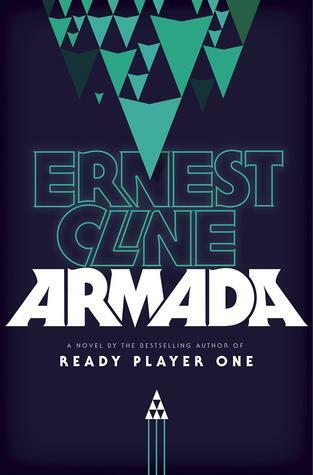 When I first read the synopsis for Armada months ago my stomach sank as I thought to myself, “This sounds like a rehash of countless already existing sci-fi classics…” though I immediately sprung back because I knew that Cline would have his own clever twist on the story. “Surely he’s using these stories as inspiration; it won’t be the exact same thing,” I rationalized. Well.. let me just put it like this: having the protagonist say, “Everything that is happening to me feels just like it came right out of my science fiction stories!” in a painfully self-aware fashion in order to rattle off the titles of some fan-favorite books and movies is not an excuse for an original plot or creative writing. Reading Armada can be likened to reading Ender’s Game, but in the first 20 pages Ender watches a copy of The Last Starfighter before going to Battle School. The experience is still a good ride, but every key plot point is excruciatingly telegraphed in the opening pages of the book. Not a single event caught me unaware or truly rewarded me as the reader. Now, I understand that Ernest Cline has the right to craft the book he wants to and he owes me nothing, but I would be very hard pressed to recommend this piece of fiction as opposed to any of its many predecessors. Ready Player One was about the characters’ actual lives being turned into a video game. Armada is about the characters’ video games being turned into their actual lives. Science fiction and fiction in general hinges on suspension of disbelief. The reader has to be able to compartmentalize their own knowledge and understanding and put it aside in order to take on the perspective that the author gives them. In Ready Player One it’s okay when someone references Star Wars or hops inside of a Gundam because they are gamers who are fighting to save their video game world. The stakes aren’t so high I can’t forgive the campy references. However, when the script is flipped and the aliens are coming to destroy everything that we know and love, I find it pretty unacceptable to have a high ranking military officer in charge of the Earth’s last defense getting blazed on some scientifically engineered VIDEO GAME WEED before boning one of the Earth’s best Interceptor fighter pilots named “Kushmaster5000” (I wish I was making all of this up, I really do.) There are many scenes like this in Armada, and I find them terribly distracting and derivative of the already uninspired plot. Though there are equally as many placed references that truly brought me joy and I found myself smiling at, they don’t carry near as much weight as the ones that “ruined the moment”. Ultimately, I’m disappointed. 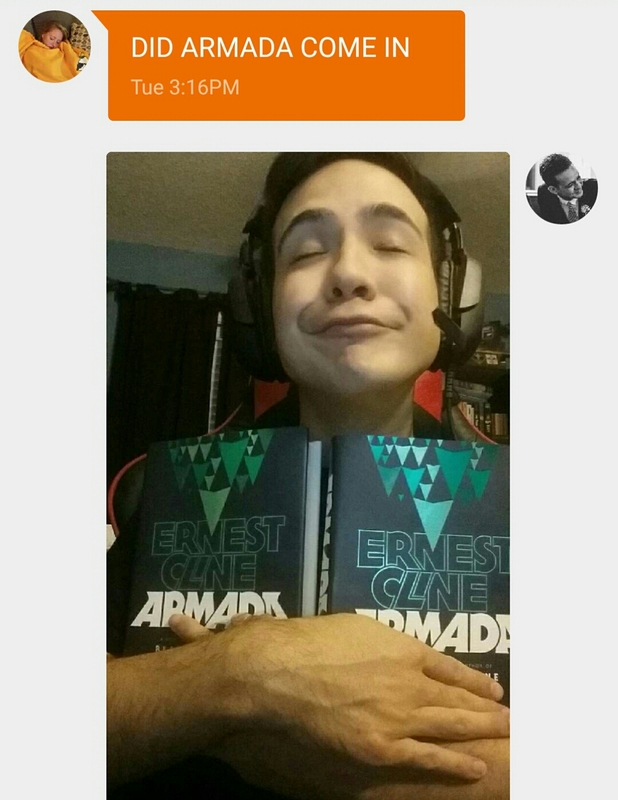 I’m disappointed that Ernest Cline would take his gift for storytelling and his vast knowledge of this shared nerd culture we all have and produce the story that is Armada. I gave him the benefit of the doubt, and I was spurned. When I have the desire to revisit an exciting nostalgia thrill ride, I will be reaching for Ready Player One long before I will Armada. With that being said, I love what you do Ernest Cline, and I eagerly await your next work. I’m finally onto the 3rd and probably my favorite segment of what I read this past year. My 3rd 9 weeks’ reading list began during Christmas Break, which allowed me to squeeze an extra two weeks of reading onto my reading log. I read some of my favorite books during this 11 weeks, and it’s also when this blog was spoken into existence. I believe during this time I became more intentional about what I was reading, giving my literary life purpose and spontaneity at the same time. From January to March I read more pages, began seriously reading comics, read a couple classics, and read what is now my all-time favorite book, which I will post about at the end of this list of recommendations. Take notes and enjoy! 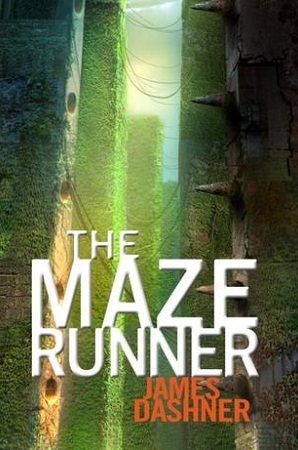 The Maze Runner series is one that gained publicity this year by earning its own movie. The cover art for the series was appealing to a young audience, and the plot was intriguing to students who desired adventure with a little mystery attached. This series was so popular in my classroom I couldn’t get my hands on it long enough to see what I thought about it. No one checked it out for Christmas break, so it made its way to the top of my list. 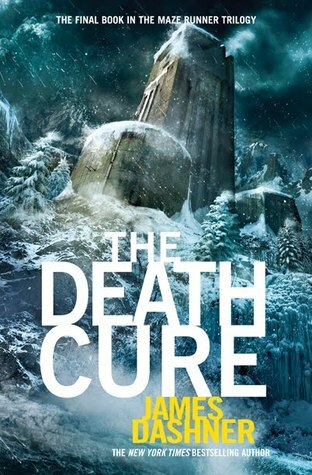 It was a quick and enjoyable read despite some of my issues with Dashner’s writing style. It was fast-paced, which is great for young readers, but the plot’s intensity and shocking events are what drove the novel. The writing is slightly jarring, and at times it’s way too obvious it was written with kids in mind, which makes it hard for older readers to enjoy it, too. The first book was the best in the series, although I haven’t read The Kill Order yet. 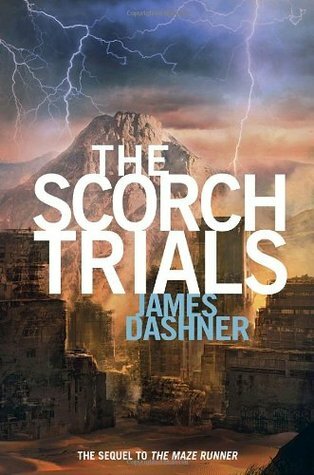 The Scorch Trials and The Death Cure seemed to both lag at times with frustrating plot twists and character choices. Regardless of the problems I had with the series, it was a fun read, and I found I was unable to put it down once I’d started. The 5th Wave took me all of 24 hours to read and left me of the edge on my seat all the while. 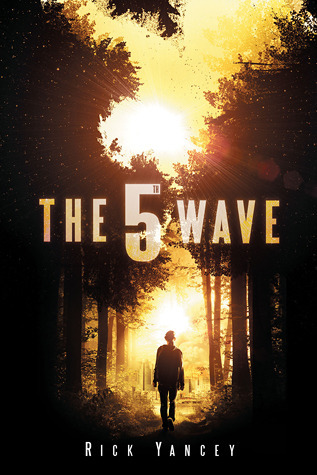 I was entranced by its cover art and more and more curious about what the 5th wave actually was the more I read it. The series opens up with Cassie Walker alone in her tent clutching her gun, thinking about her little brother, who she willingly sent away with Them. Earth has been invaded by Them, who sent several different waves down in rapid succession to take over the planet. The first three waves were easy to understand, but these last few waves have left the remaining human inhabitants alone, able to trust no one. Cassie is haunted by the lives she’s been forced to take and the knowledge her brother’s rescue may be impossible. She finds herself injured and in the care of Evan Walker, and although she can no longer be trusting of anyone, she finds she must trust him to survive. The series is told from many perspectives, giving the story a wholeness and a certain omniscience about it that is encapsulating. Both Cassie and the reader discover what the 5th wave is together, forcing them to survive through the shock and continue on Yancey’s thoughtfully designed journey. The first book has been my favorite so far because of the perspective we get to experience, but both have earned a deserved 4 stars or higher on Goodreads and in my gradebook. The third book is set to come out May 2016, and I will be preordering it. 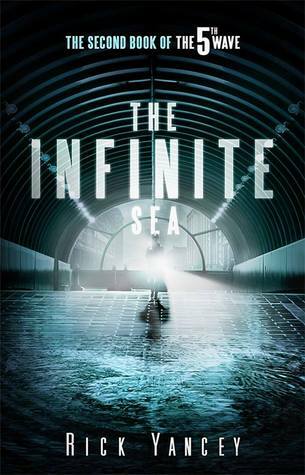 I’ve recommended this book to anyone who enjoys a good sci-fi read, and although it a Young Adult book, it is targeted for a more mature audience (early 20s). Batgirl, like many other DC heroes, got herself a fun and modern reboot last year. I have loved reading Barbara Gordon’s story so far and will likely keep up with it for a long time. 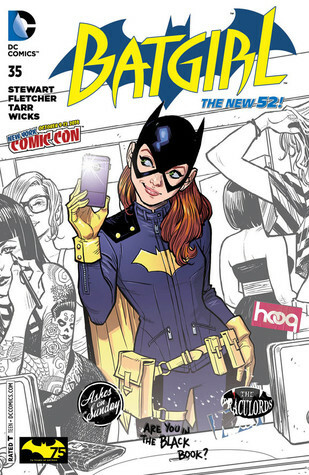 Her outfit, lifestyle, and the technological aspect of Batgirl’s crime fighting is relatable to my generation, and the first volume of the new Batgirl of Burnside has a despicable villain that came as a shock to me and many other readers. If you haven’t kept up with Batgirl until issue 35, no worries. Cameron Stewart has completely remade Barbara. She has flaws, personality, and flair, and I can’t wait to read more of her this year. Ryan Dean’s life at private school is for mature readers only. Because he is two years younger than his fellow classmates, he is picked on and envied by others for his intelligence and constantly being placed in the friend zone by his best friend, Annie. As a junior in a private school for rich kids, Ryan Dean finds himself in trouble most of the time, and although he/s often extremely witty despite his unfortunate situations, the novel ends on an unexpectedly sad note. 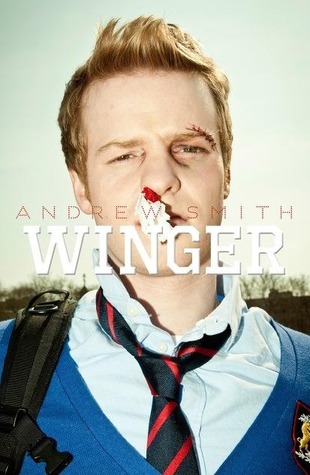 Andrew Smith has written many other wonderful books, and Winger’s sequel will soon be published. It’s titled Stand-off and is expected to be available this September. Despite its size, it’s a fast read, and you will find yourself in tears from laughing and from its shocking conclusion. 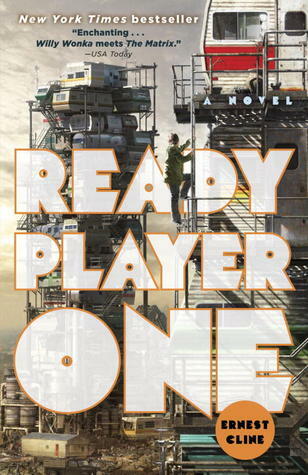 We’ve finally reached the end of the 3rd 9 weeks’ reading list, and I can’t think of a better way to finish this post than with my favorite, Ready Player One by Ernest Cline. This is another one we’ve already reviewed here on Tome Raiders. A movie directed by Spielberg is already in the works, and I can promise you you will not be disappointed in this one. It’s futuristic and modern all at once, it has a striking cast of characters, and it explores themes that face the youth of today. Can we be the same people we are online and in real life? Does technology provide us with better opportunities or are we losing ourselves to it? Can the power of goodness and friendship overcome the power of money and corporation? I’ve been tempted to reread this since putting it down, and I am looking forward to Cline’s next novel, Armada, which I think was written with a hint of Ender’s Game in mind. I can’t say enough good things about RPO or Ernest Cline, and my review barely does the book justice. Cline has come up with a piece of perfection that I feel obligated to pass on to everyone I know. Please let me know which of these reviews you found helpful and what you’d like to see more of on the blog. If you have a recommendation for us here at Tome Raiders, we’d love to hear it. We’re constantly look for new books to read and review. A science fiction classic in the making, Ready Player One immediately grabbed my attention by being completely plausible. “I could totally see this happening,” I thought to myself during the first chapter. Cline seemed to effortlessly cast a protagonist who anyone would feel compelled to root for while simultaneously casting his counter-part to be The Corporation and Big Business we all fear will take over our meager existences and cause worldwide unhappiness by diminishing our personal rights and freedoms. Basically, my jaw dropped early in the prologue and continued to hang open for the remainder of the novel. I respect any author who can set up a plot and create an entire dystopia so successfully during a time in literature where imperfect dystopian worlds run rampant and are often not thought out enough. Ready Player One embodies many modern themes that plague the human race, however I won’t mention them all as to avoid spoilers. Similar to previous dystopian novels, Cline perfectly tackles the world’s current problems through his words; we of the world are destroying its energy while constantly seeking refuge in our own realities rather than living in the world itself. This notion along with the countless 80s references and relatable geeky characters littered throughout Ready Player One have boosted it to my high score table of Best Books Ever. 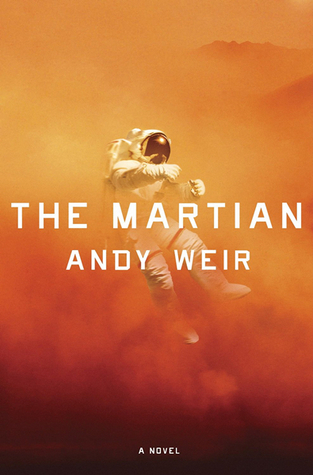 The novel follows protagonist Wade Watts (a.k.a. Parzival) throughout Cline’s virtual reality game of the OASIS, which is what all of us video gamers dream of coming true. Despite the limitless possibilities and worlds within the OASIS, it sheds both a positive and negative light on reality. Because our future selves have destroyed many of the earth’s resources, many have decided to use the OASIS as an escape from the tragedy and brokenness of society. For kids like Wade, who are poor and have no real family, the OASIS gives them an identity they can shape for themselves, which I believe is an excellent concept. The creator of the OASIS, Halliday, was born in the 80s and amassed an unreasonable amount of money from the profits of it, even though there was no fee for joining the OASIS community. He died with no friends or family, so in his will, he created a giant Easter egg hunt full of riddles and 80s trivia. So, although Cline’s world is set in the 2040s, there are 80s references everywhere, giving the story plenty of relatable nostalgia. The unpaid “professionals” who spend all of their time online hunting for these eggs are known as Gunters, and Wade, who has no money to do anything else, has spent the last 5 years gathering knowledge for the hunt while playing through 80s video games. Several years after Halliday’s death and still no one has been able to crack the only riddle he left behind. This is where we put on our own haptic suits and insert ourselves into Cline’s dystopian world to watch the plot unfold. I am anxious to see the movie and read the sequel when they are completed. I would not hesitate to recommend this book to anyone. Everyone has something to gain from reading it, and this is especially true for anyone remotely geeky over the age of 25. 5/5 stars. Joe and I will be filming an in-depth video discussion of this book very soon, which will contain spoilers.